If you like rums, single malts or cocktails (or beer – they have Žatec on tap) like I do, I’d recommend this bar in the middle of Žižkov. Actually, Malkovich is not a typical Prague bar. No long bar counter, no smoking inside, no neon signs. Outside there are in fact no signs at all, so you can easily miss this place especially in winter (there are tables outside during summer). When I visited Malkovich for first time I was thinking I’d just entered somebody’s apartment in the ’60s for a split second – vintage wallpaper and furniture, jazz music and candles. 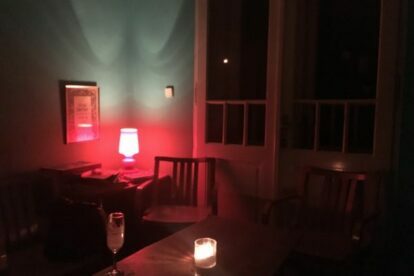 But after I saw a little bar counter and a lot of bottles lined up on shelves and sat at an old table with my drink, I just enjoyed the mellow atmosphere of this place. And to my surprise, my waiter really looked like John Malkovich. This place is really about drinks, no food is served here.